The great fire of London, the Plague and the civil war are just three of the main subjects covered in the war, plague and fire gallery at the museum of London. The gallery covers the period between 1550- 1660 a short period of history where London went through great turmoil and destruction. The city of London changed forever during this period and its effects have been felt in the capital city ever since. This video gives an overview of the new gallery. The English Civil war 1641 - 1651 was a time of great conflict between the royalist of King Charles the I and the roundheads under the leadership of Oliver Cromwell. Many battles were fought with the roundheads finally winning the war resulting in the execution of the King and the creation of a short lived commonwealth. Oliver Cromwell died in 1658 and was buried at Westminster abbey with great ceremony. However interestingly his body was dug up several years later and a posthumous execution took place with his body being hung and his head then being severed and displayed at Tyburn for a time. 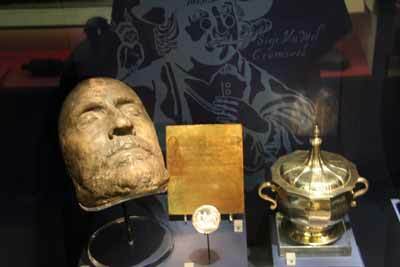 Death masks were very popular at the time and a rather ghoulish copy of Oliver Cromwell's death mask can be seen in the gallery along with several of his possessions. The plague which took place in London in 1665 took the lives of thousands as it swept through the city. The disease was only finally stopped by another great disaster befalling London, the great fire of London which happened the year after in 1666. The great fire of London is perhaps world famous and many visitors come to London to see the starting place of the fire which is commemorated by the Monument. The fire changed the physical shape of London forever, causing a whole new layout of streets and roads to me created afterwards. The fire made many thousands homeless and destitute and for a long period afterwards many had to live in makeshift campsites for some time. The city was gradually rebuilt on the same street plan as before but gone were many of the narrow streets and wooden houses were replaced with brick ones. 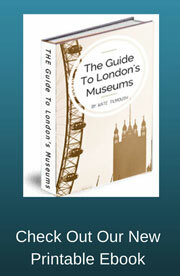 This gallery in the museum of London houses one of it's oldest exhibits commemorating the fire of London. A model of London which was made in 1914 and which shows the start and spread of the fire through the streets. The exhibit has been totally brought up to date along with the rest of this gallery which had not been touched since the seventies. The gallery is now bright and vibrant and is far more hands on, with firemen's helmets to try on, interactive exhibits and easier to read panels of information. 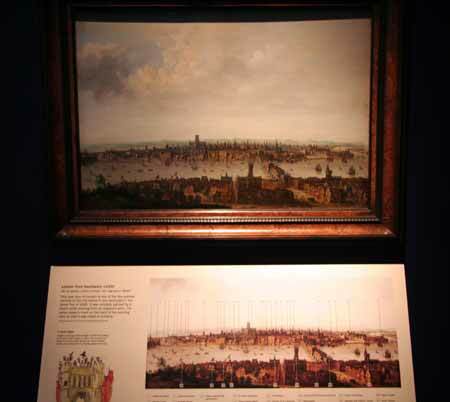 One of my favourite items in the gallery is a painting c1630 which shows London before the Fire of London. The buildings are pointed out on a separate panel underneath and famous buildings such as St. Pauls cathedral, Somerset House, Whitehall Palace and the Globe theatre can be clearly seen. This gallery is probably one of the best known areas of the museum and is now certainly a more inviting place to come and visit. Make sure you take your time to discover this period of London history and explore the exhibits as it is certainly crammed full with fear, change and rebirth, what more can you ask for from a museum.